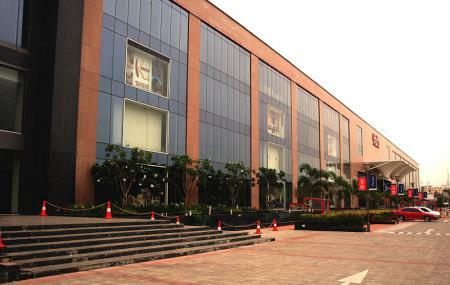 One of the most happening malls of Chennai, the Express Avenue Mall is a favourite shopping destination of the locals. Apart from shopping, people resort to the mall for various entertainment opportunities and dining too. There is a movie theatre inhere along with a kids’ play zone, and a gaming zone too which is the largest in South India. Fine dining restaurants and a food court make for it an ideal jaunt for all kinds of budget. There is a lounge bar too which is packed on the weekends. Along with these options you will also find several events and exhibits happening here, rendering a buzzing vibe. It is very well run, given its being of a subsidiary of The Indian Express Group. The mall also lots of business avenues, for business meetings, conferences and the likes. Also, visit the popular attractions in the city by following Chennai itinerary 1 day. How popular is Express Avenue? People normally club together Marina Beach and Tirumala Tirupathi Devasthanam while planning their visit to Express Avenue. Express Avenue is one of the best mall in the Chennai city and my favorite restaurant CHILLI'S is there though they have disappointed me last time with there food but still There are lots of fun activities are arranged here on weekends as well as on the special days. I have enjoyed my time here as I visited this place on Sunday and lots of fun loving activities were happening there. It's really very good place to visit with your friends, families and loved once. One of the most visited mall situated in the prime location. All the best apparel brands have a shop over here. During the sales offer of the year they do good business. Food courts joints are often very attractive along with cinema where most people come only for this. When it was declared open, it was one of the 1st few modern Malls in Chennai... other than this, we hardly had any other malls of this size... This Mall was the pioneer in bringing multiplex Malls to chennai. Have been here so many time officially, casually, just hanging out, cinemas & what not. Centrally located with road connecting 3 sides of the mall, making it accessible from any direction. Initially it might be a challenge, once you figure it out, its a cake walk.